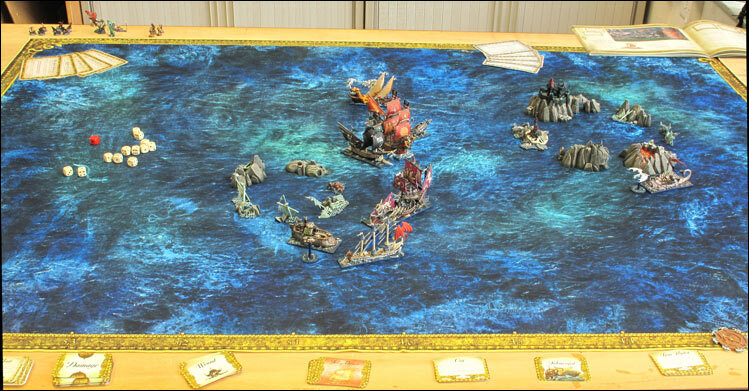 It seems that while I was out in meetings yesterday, GW decided to put up a run through of a turn of Dreadfleet. Good plan. This looks pretty much like what I’d expected: a simple roll hits, roll saves kind of mechanic with a bunch of cards thrown in for good measure. It’s light and fluffy and sounds very random indeed, but a bit of a laugh as long as you don’t take it too seriously. A sort of Wild West barroom brawl of a game, with the varied characters being ships instead of cowboys. With this level of layered randomness (roll dice to decide how many cards you draw) it should suit non-gamers fairly well as this levels the playing field a bit. So far this looks like it’ll make a good game for existing gamers to introduce the whole idea of tabletop battles with miniatures to their friends. It won’t be the right one for everyone (this process really needs a careful tailoring of game to inductee to work well) though if someone were hovering on the edge of the GW hobby in particular then it might be just the ticket. This entry was posted in Board Gaming. Bookmark the permalink. 15 Responses to That’s More Like It! Hm, do we already kno what the mat is made of and whether it comes rolled or folded in the box? The only photo of an open box that I’ve see looks like folded, but it also makes the mat look quite soft. Their flock cloth battlemat thing was fine folded and went smooth afterwards, so they *can* get this sort of thing right. Good. Would be great if it would be the same kind of mat, cause the grass mat is ace! Whether the mat is rolled or folded, isn’t really the sort of thing that would stop me buying the game. They’ve already said its a non crease mat and as I’ve come across those sorts of products before and they’ve always done what they said they would, e.g. not crease I’ll take their word for it. As for the rules run through, whether they planned to do it or whether they’ve responded to the withering hail of criticism on the internet for not showing the game in action is a moot point… they’ve done the right thing. I’m personally a lot happier knowing how it plays now. Is it for me? No I really don’t like games to be balanced via randomness, while mathematically its an exceptional way of achieving a degree of balance over a long series of games it can also lead to wild imbalances within a single game. Some of the mechanics look fun and I’ sure others will get plenty of enjoyment out of it. Its just one naval game too many for me and I don’t think it’ll have the longevity I’d be looking for, although I know that’s not what it was designed for. Still they get a thumbs up for finally showing people the product and they deserve some credit for actually listening to peoples concerns finally. We have one on route to use at the club, and having never played Man-O-War as it never appealed to me at the time, I am quite looking forward to giving it a go. Seems a fun simple run out and some of the models are superb. 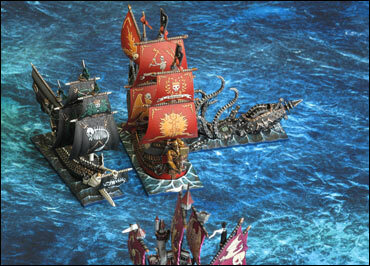 Just look at the Chaos Dwarf ‘Iron Kraken’ (I think it is called that) Looks very impressive and it should do well. I too am hoping that there are more standalone games like this in the future, but then I do like my board games as well as tabletop battles. Maybe that’s where the major fault line lies: people who play only tabletop games on one side and those that also play board games on the other? It’s a simplistic concept, but may have a grain of truth in there. You may well be onto something there. I know at least one ‘dyed in the wool’ gamer who professes to ‘hate’ boardgames, though strangely he likes Space Hulk just as much as me – when pressed on this fact he told me that Space Hulk ‘isn’t like a boardgame’. I suppose he has a point – kind of. I suppose that last one applies everywhere, but it seems particularly prevalent amongst GW ‘fans’ of a certain stripe. I am no fanboy of GW – believe me there have been decisions by them that hace befuddled me entirely, not least of which is the whole ‘finecast’ debacle, where they made the spectacular mistake of releasing the Finecast range at the same time as they did their annual price review (read: price hike), thereby compounding what was already a fairly ropey decision of pricing miniatures made from a cheaper material than metal at comparable prices to comparable metal miniatures. I haven’t bought White Dwarf for nearly a year (after realising that I was buying it more form habit rather than because I was actually reading it) and I generally stick to the books and buy any bits and bobs second hand or from my FLGS. But I have been ‘in the hobby’ for a good twenty years now, and I’m sorry, but I don’t recall this magical period of time that the naysayers constantly hearken back to when everything was super cheap and GW were this big fluffy benevolent communist collective that flung products at people with gay abandon. What I do recall quite clearly is that as long as I can remember GW was an expensive hobby. The difference now is that I am an adult (apparently) with my own disposable income rather than reliant on my parents, so if I choose to spend it all on cool little minis and games then that’s rather my lookout isn’t it? End of the day, this is a cool little game that will play out in an hour or so and can be used to introduce non gamers to the action as well. The components look beautiful and the price, while high, is not as astronomical as some seem to feel. I will concede that I am lucky in that I have a couple of friends who are independent retailers who are happy to reserve me a copy until I can save up the cash, but if that wasn’t the case, I would just have a serious look at the finances and make a decision. Because I am (again supposedly) an adult, and that’s what adults do right? Glad to have you along for the ride, Greg. Personally I think we are in the “Good Old Days” now, but that’s a whole other post. Finecast is one of several examples which I think were reasonable ideas and can understand from their point of view, but which was handled very poorly (in a PR sense). GW don’t have a monopoly on this sort of silliness as the current furore over the new Mantic plastics goes to show. Of course, what probably matters more than how peeved one was at the time, is whether it turns out to be a good idea in the long term. In 5 years, will everyone be saying how GW’s Finecast models are so much better, sharper, more detailed, etc than the competition’s metal ones? I suspect that or something very like it. Hm… did you like X-Wing?